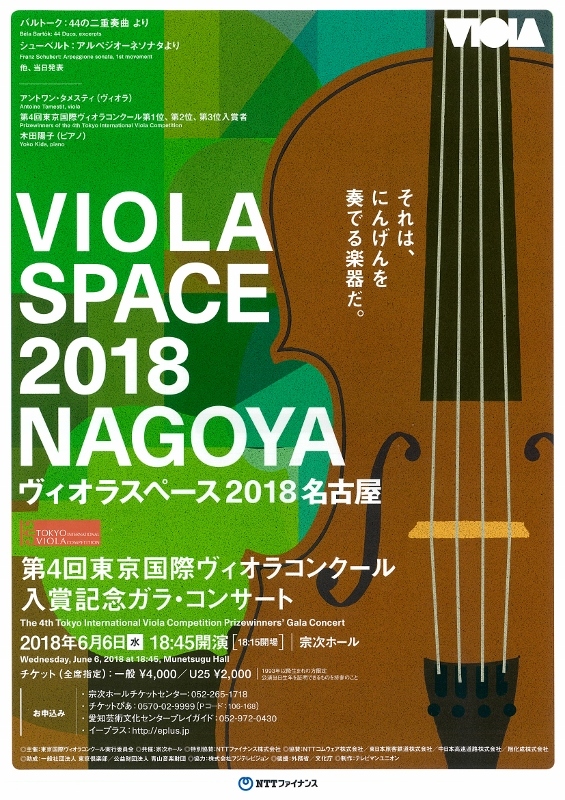 From May 26 – June 3, 2018, Viola Space 2018 will host the 4th Tokyo International Viola Competition (TIVC), the only international competition in Asia-Pacific exclusively for the viola. 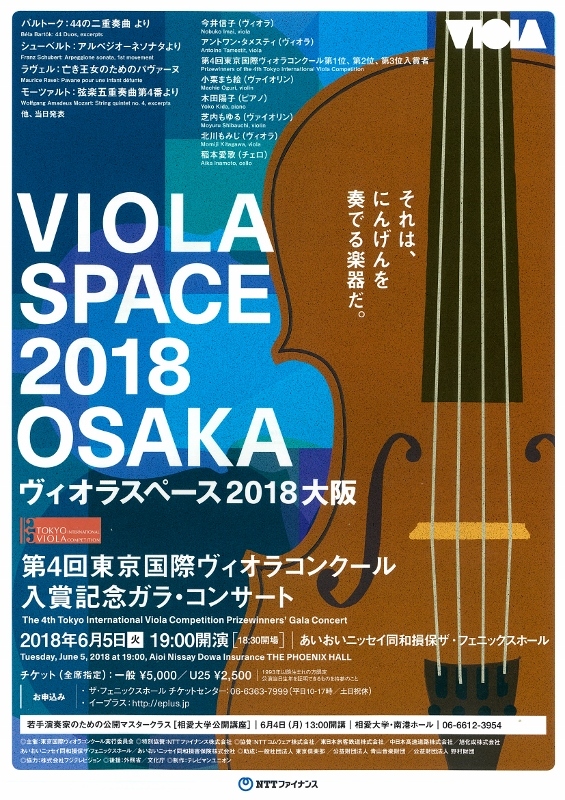 Viola Space is a festival for viola founded in 1992 through the initiative of internationally distinguished violist Nobuko Imai and dedicated to "celebrating the viola, introducing outstanding works and new works for viola, and promoting young artists". The TIVC was launched in 2009 as a part of Viola Space. 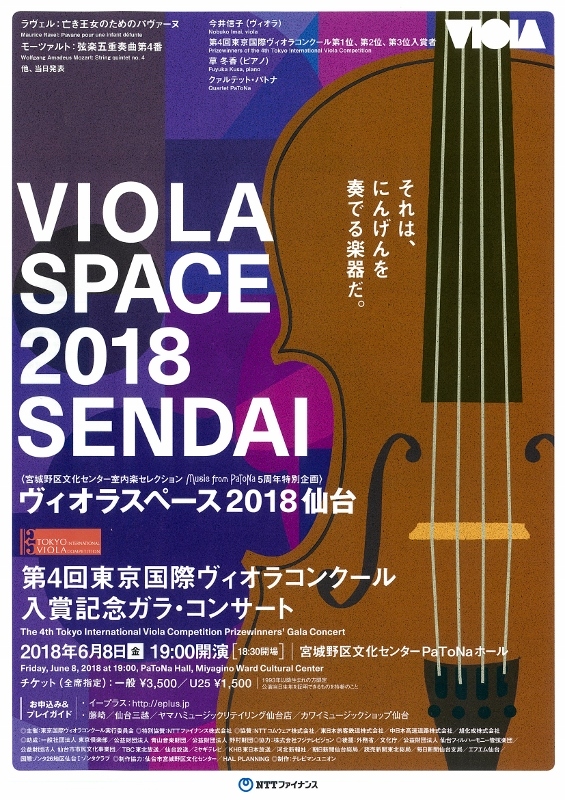 It is held every three years, and offers winners the opportunity to perform at concerts held during Viola Space in future years. In every edition of the TIVC, talented violists from all over the world gather to perform various pieces in the rich viola repertoire. Each stage of the competition from the first and second rounds to both parts of the final round is open to the public. In addition, in parts 1 and 2 of the final round, the audience will participate in the selection of the winner of the Audience Award. The winners in the previous three editions of the TIVC have gone on to shine on the world stage as performers and instructors, demonstrating their talent in various ways. 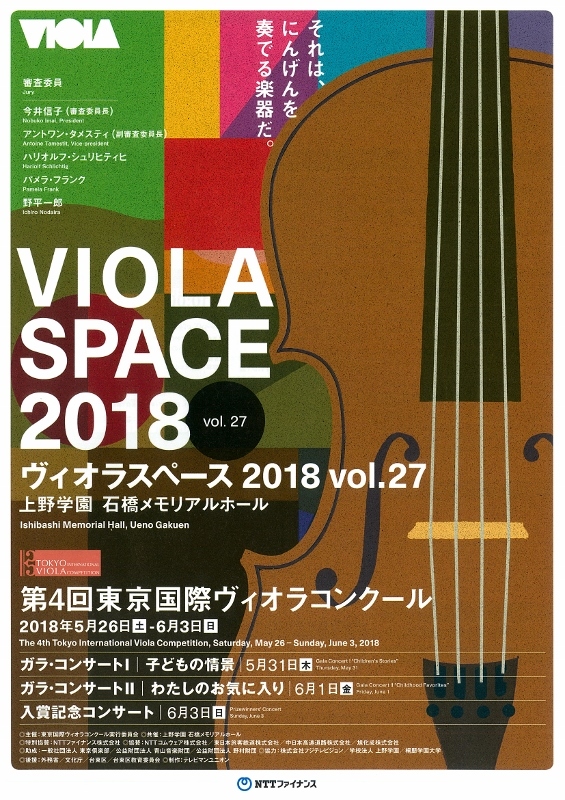 The final round will be held on the 2nd and 3rd of June, and this year's 1st prize winner will receive JPY 1,000,000 and a viola d’amore, made and donated by Robert Blaszauer, along with opportunities to perform in concerts. The 2nd and 3rd prize winners will receive JPY 600,000 and JPY 300,000 respectively. There are several other special prizes, including an Audience Award, where the winner will be selected by audience vote in the final rounds. The 2018 jury is composed of Nobuko Imai, Antoine Tamestit, Hariolf Schlichtig, Pamela Frank and Ichiro Nodaira. Please refer to our website for further details. It is worth noting that this year, the work commissioned by the Competition to be performed in the second round is by one of the jury members, Ichiro Nodaira. 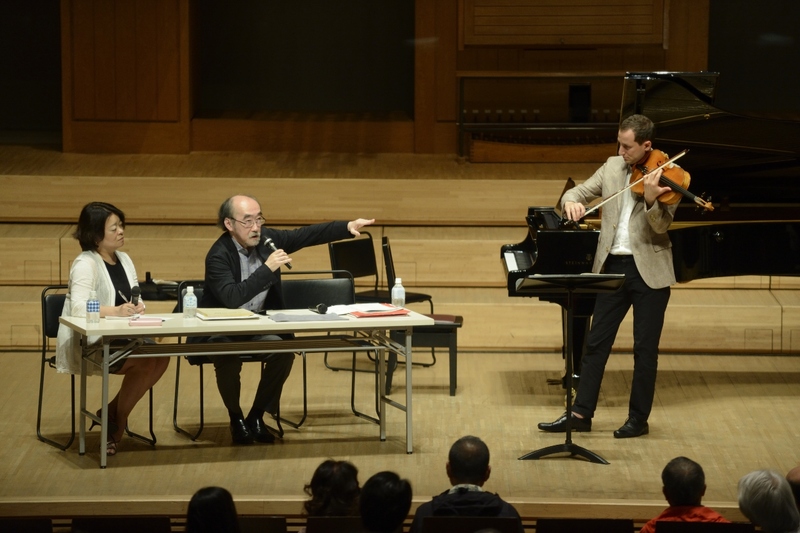 In addition to the competition, there are regular concerts and open master classes by jury members and other top-class performers, with the various activities aiming to introduce the audience to the appeal and potential of the viola. The gala concerts by jury members are a unique and very popular part of the Competition. This year's theme is "children". The pieces to be performed have been selected with a focus on childhood experiences and on the connection between music heard as a child and the present. Furthermore, we also aim to make the experience of participating, not just competing, meaningful to all the contestants, providing opportunities for unsuccessful contestants to consult jury members, and participate in workshops. 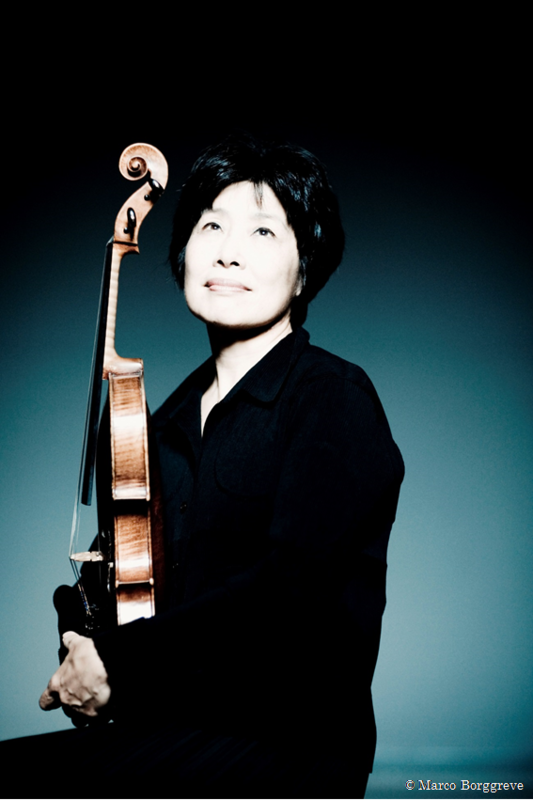 With a jury led by world-class performers like Nobuko Imai and Antoine Tamestit, and a spectacular repertoire of works for the viola ranging from the classical to the contemporary, as well as young, up-and-coming violists from all over the world gathering to demonstrate their talent, the Competition is bound to be a dramatic experience. We hope that you will assist us in spreading the word so that music fans from around the world visiting Japan can also enjoy this unique experience. Please also note that on Saturday, June 2, after the announcement of the results of the Final round 2 "Concerto", there will be a press conference by jury members and competition winners. We hope you can also join us on this occasion. 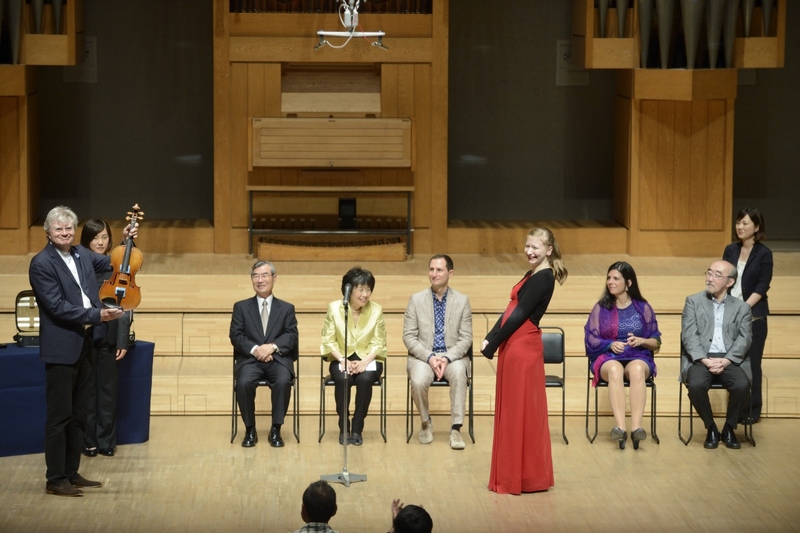 June 1 (Fri) 10:00 Final round 1 "Sonata and Contemporary"
June 2 (Sat) 15:00 Final round 2 "Concerto"
Finally, below are some comments from each of the jury members, taken from a press conference held on June 6, 2015 following the 3rd TIVC. "This year's first prize winner, Andrea Burger, also participated in the previous edition, and even then I felt that she had a lot of potential. Kei Tojo, in second place, was impressive in the naturalness of her style. The third prize winner, Louise Desjardins, expressed her every thought in her playing". 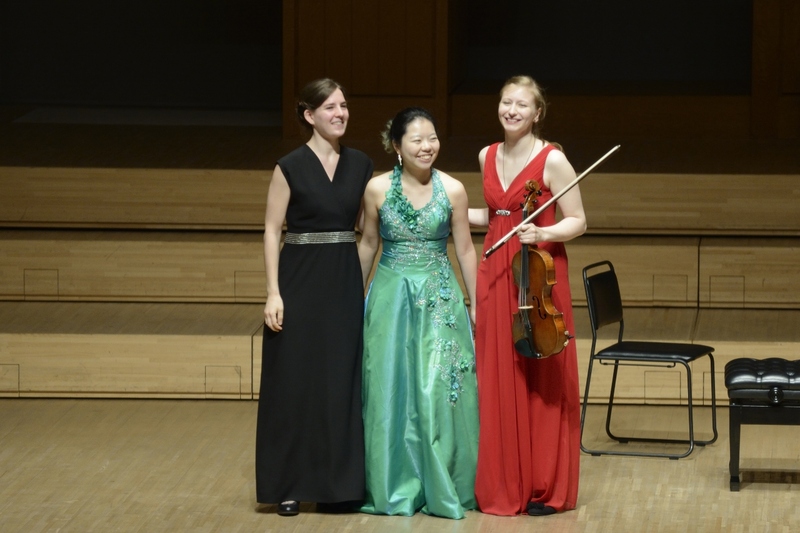 "In selecting the pieces to be performed in the competition, I paid careful attention to the aesthetics of the viola. During the competition, I found myself enjoying listening to the pieces, as if I was at a concert, which shows how difficult it sometimes can be to be a jury member". "In each round of the competition, I could see that the contestants all found new potential in themselves, and they all demonstrated their own musicality. I would like to congratulate each and every one of the contestants". 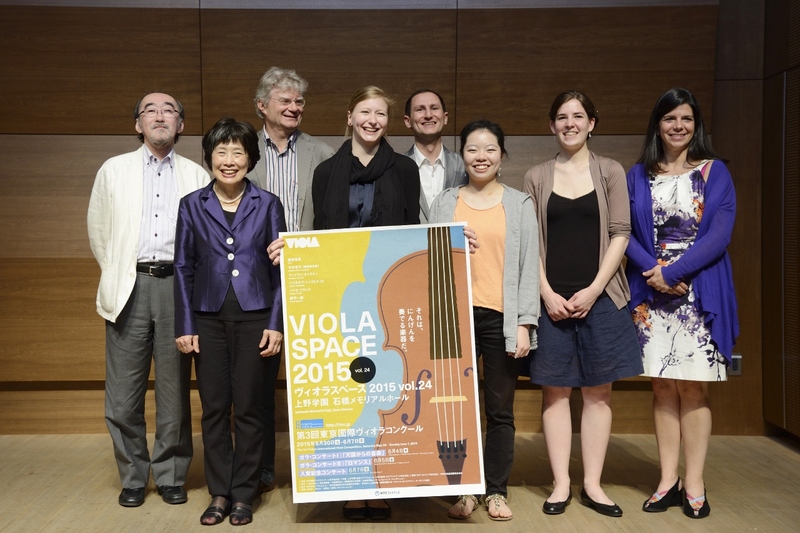 "The future of the viola is dependent on Viola Space. I am proud to have been able to join the jury alongside colleagues I truly respect". "It is very significant that this competition pays tribute to contemporary pieces, not only in the commissioned works, but in various other aspects of the overall programme".